Duane Reade in New York City. Their perspectives are very interesting, especially Luca speaking on structural chemical relationships. Just keep in mind, as Greg has reminded me, they represent the large perfume conglomerates. The book Perfumes: The Guide was the rave at the latest Sniffapalooza in NYC. All the "perfumistas" have been talking about it. It's on my list, just as soon as I'm done with Jitterbug Perfume. 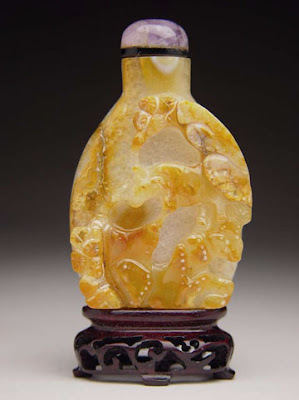 The image is of a Chinese snuff bottle gifted to me by my lovely mother. I have another one, almost identical that was given to me by my father.